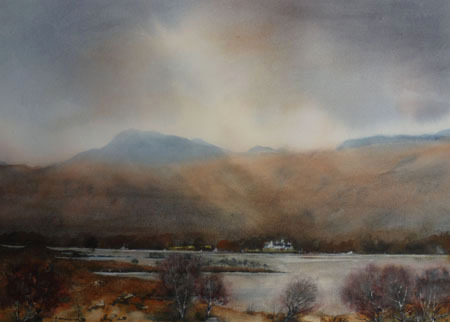 'Letterewe House under November skies - Loch Maree. A larger version of Letterewe House from across Loch Maree. I was particularly interested in the earth colours of bracken and heather still vibrant in late autumn. But inevitably the eye is drawn to the far off elegant splash of white that is the House of Letterewe estate set in inaccessible and splendid isolation on the far shore.